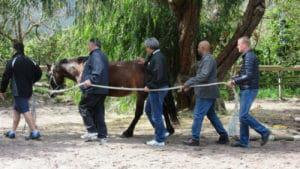 WHY CHOOSE TEAMBUILDING WITH HORSES? Our cutting-edge, experiential programme uses the abilities of horses and their natural herd dynamics to take leaders and teams to the next level. Through involvement in carefully designed activities, individuals learn about themselves as they experience and see their strengths and challenges from a new perspective. This is a unique, innovative and fun approach to team building. Studies show that only 15 percent of a person’s success is determined by job knowledge and technical skills, and 85 percent is determined by an individual’s attitude and ability to relate to other people. Horses are our diagnostic wizards, reflecting where an individual or group is aligned and working effectively and where the gaps or lack of clarity and communication are impeding one’s success. These unbiased reflections help one to develop the inner commitment and character required to be successful in this rapidly changing world. Teams are encouraged to use creative strategies to problem solve and negotiate with one another and the horses through focused activities. The experiences in the arena allow for metaphors to emerge, which link up to the ‘real life’ i.e. work and personal space. The horses might become the current challenges or clients and respond to the team’s dynamic and the individuals’ behaviours – including thoughts, intentions and feelings. Through the horse–team relationship, the participants are given an opportunity to explore, adjust and gain awareness that can result in desired outcomes/goals. 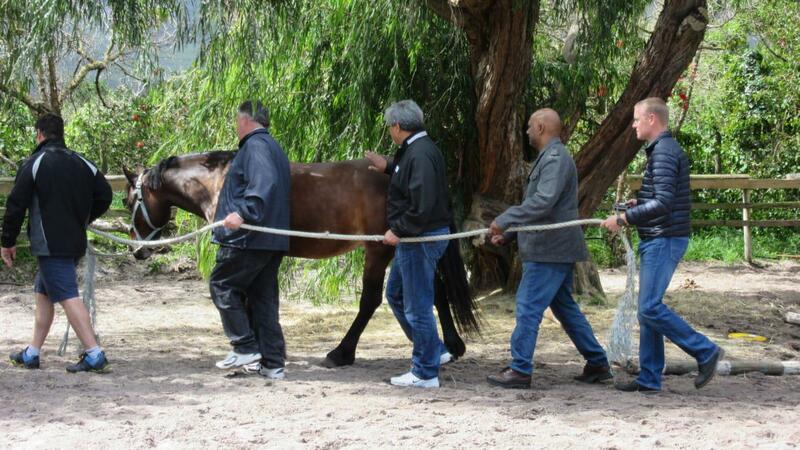 Using horses in Team Building is a powerful method for developing strengths and recognizing and addressing weaknesses. 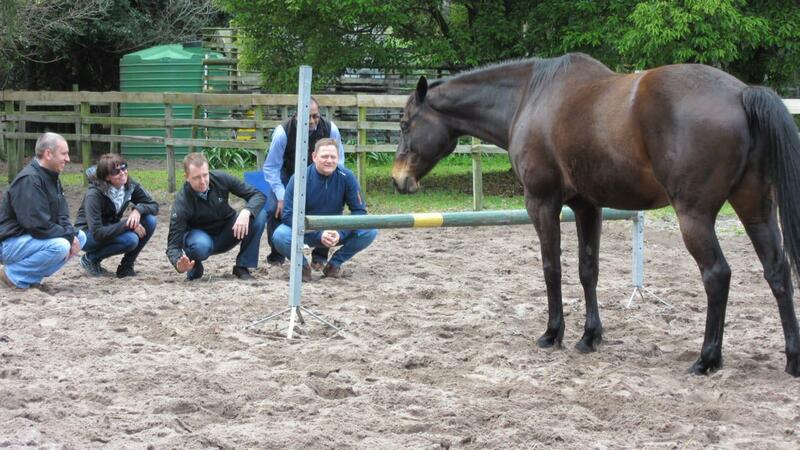 WHAT HAPPENS IN A HORSE FACILITATED TEAM BUILDING SESSION? Challenging and innovative group activities in partnership with the horses test cooperation, collaboration and creativity. Participants face unfamiliar situations and tough decisions that teach and strengthen team cohesion, communication and proficiency. The activities are ground based, meaning, there is no riding of the horses involved. The facilitators observe how the horses respond to the participants, and how they interact with one another. Upon completion of each activity, all participants return to a central location and a discussion is facilitated on what the participants saw, heard, felt and learned through the experience and how they can apply this new information to their professional and team development goals. All sessions cover the previously mentioned outcomes however if you have specific team needs or goals in mind, we can tailor-make the session to address these. 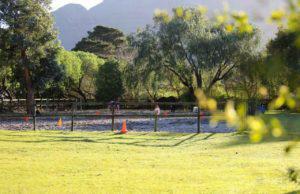 We offer our team building experiences from a beautiful private farm in Noordhoek. With the rural surroundings and views of the mountains, your team can be assured of a wonderful experience where they can take what they learn back to the office and to their personal lives. If you are organizing a conference, seminar or training event, we can refer you to special venues in the area. There are also great restaurants in the neighbourhood. It’s possible to overcome old fears and patterns by just taking a chance and jumping in. Take a moment to stop and plan before just jumping in and starting before doing any basic planning. Don’t just rush into the task. Go slow to go fast. Work as a team with inputs from everyone. I need to learn to speak up more clearly when there is something that I want.